There are two things when learning about Alt that were always consistent: 1. Bring fun business cards to share, the more creative, the better and 2. Dress nice, especially for the themed parties there are each evening. Now, I don't have a logo, but I was able to put together a business card with relative ease using Photoshop and uploading it to MOO.com. The process was fun and the cards came out cute. As far as my outfits were concerned, I typically work from home and usually don't have a reason to dress up, so I welcomed the opportunity. I mainly just shopped my closet, bought a new pair of capris and got a dress I hadn't worn yet altered to fit properly. Done and done....next. 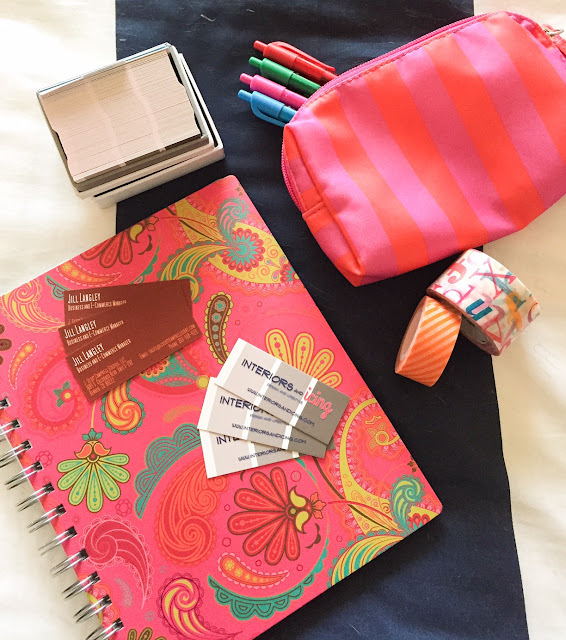 Here's two quick notes about travel and lodging. I flew into SLC airport and took the city's light rail system, TRAX directly from the airport to the hotel. There is actually a stop just one block from the hotel and it only costs $2.50 to ride. I later learned from other attendees that they didn't know that was an option and had, instead taken a much more expensive cab ride. 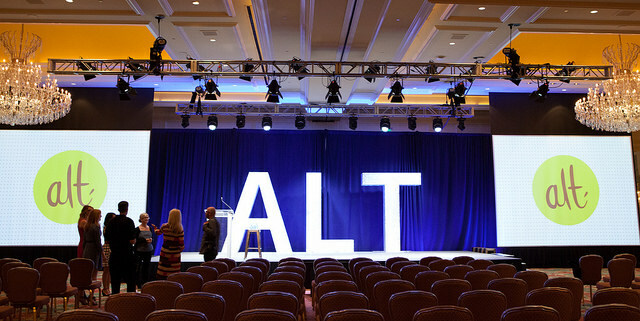 Now Alt Summit is held at the beautiful Grand America Hotel in downtown Salt Lake City. They usually offer a discounted room price for those attending the conference, but I actually stayed across the street and the Grand's sister hotel, Little America. Sure it wasn't quite as luxurious as it's big sister, but I must say that it was very nice, very clean and very convenient. Walking across the street each morning was easy and it was actually nice to get the fresh air before spending most of the day indoors. If you are trying to do the conference on a budget, I highly suggest it. 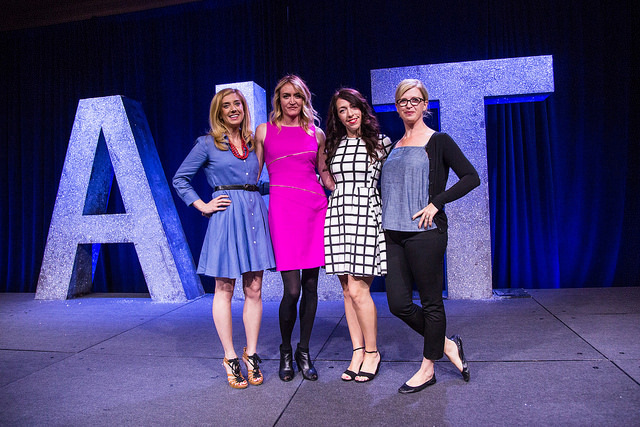 The conference opening keynote speaker was actually four speakers! All bringing an engaging, yet, different view and topic to the stage. First up was Danielle Krysa of thejealouscurator.com. She compared being an artist and creator to being in the girl/boy scouts in that we have to earn our badges and take our licks along the way, but they are all lessons that need to be learned and we should "wear those badges with pride". Badges like "I like making stuff", "Burned by a Critic", "Failure leads to Genius" and "Unblocked". Danielle spoke about, what I saw as a recurring theme throughout the conference which was "you can't please everybody". Second was Jane Mosbacher Morris of tothemarket.com. As her website says, tothemarket.com is a "social enterprise focused on the promotion of goods made by and stories told by survivors of conflict, abuse and disease". Jane spoke about valuing "your gifts" and if you don't know what they are, more than likely your friends and family do. And when it comes to supporting a cause think about the causes that move you to help you find your focus. Or ask the needs of others by asking questions. Nothing is too small. Next to speak was Rachel Ryle of rachelryle.com. She is an artist/animator who found internet fame quite quickly when one of her 15 second animations on Instagram went viral. She has since been named the #1 Instagram account (@rachelryle) to follow by MTV and Buzzfeed. Rachel talked about her quick rise in notoriety followed by an eventual "creative block" and how traveling provided her with new inspiration. She has worked with ESPN, Starbucks and was even asked to do a trailer for the movie "Kingsman". Rachel's tag line is "Good things come to those who make". The fourth and final speaker was Heather B. Armstrong creator of dooce.com and now, HeatherBArmstrong.com. She spoke on the very timely topic of dealing with negatively and haters online. Heather's very powerful speech started with an audio of a women reading several very hateful comments that have been left on Heather's blog over the years. She then went on to describe how she used to handle these negative comments by engaging and being sarcastic back at the writers, but she eventually learned that it didn't stop the comments and it didn't make her feel better either. Heather said, what what my mom has told me in recent years, which is when a person lashes out at you it's about them not you. She now has three steps to dealing with the hurtful comments now: 1. Don't seek it out. 2. Honor the fact that it hurts you. 3. Extend your hand across the table. "When you find the humanity in your enemy, the conflict is over". There was so much more good information that I can't wait to share including some of the classes I took, parties I attended and of course, the swag. So be sure to check back each day this week for more!